The floor of the space is replaced by a shallow ‘stage’ underneath which a system of microphones is installed. These pick up the sound of the viewers footsteps as they walk around the space and this is then fed to a â€˜delayâ€™ unit, producing long echoes of the sounds made. The walls of the space are covered with sound proofing material, creating an environment which plays with our sense of distance and proximity. An almost still projection of a microphone set up in the space before the build is projected on one wall, introducing a temporal element and the implication of another space. 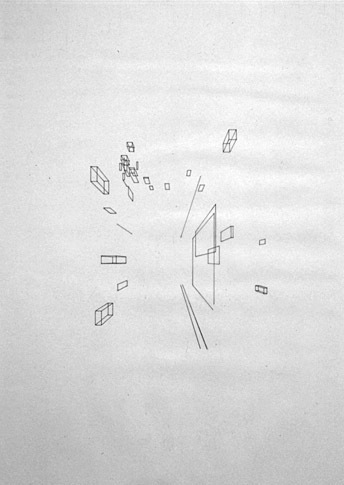 Before entering the installation there was a space with twelve drawings on show. 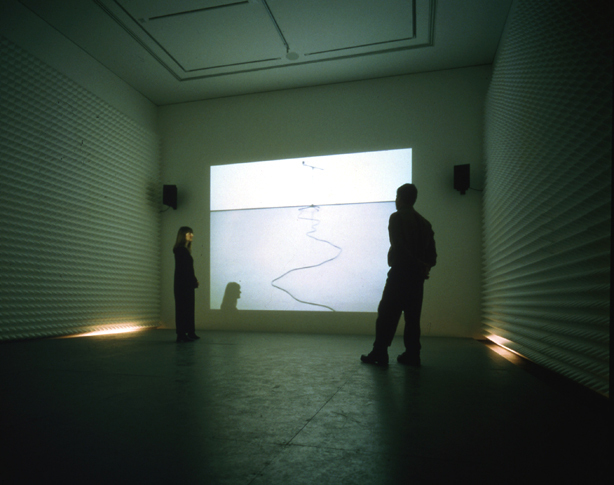 Titled ‘Drawings of Nothing and Nowhere’ they acted as a kind of anti-chamber to the main space.